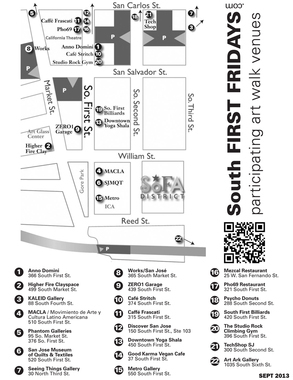 The San Jose Blog: South FIRST FRIDAYS Art Walk + STREET MRKT Today! South FIRST FRIDAYS Art Walk + STREET MRKT Today! 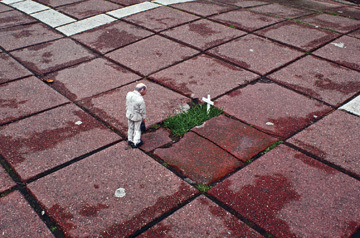 The South FIRST FRIDAYS Art Walk + Street Mrkt is this Friday, Sept. 6th, 7-11pm. In addition to 22 participating art walk venues, there's the Street Mrkt with 60 amazing artists and indie creatives selling their work directly to art walk patrons. On the live music stage is the Sunrunners + Light Thieves + Curious Quail with emcee David Knight. and here's a map you can print out or save to your smart phone. There will also be free Bike parking provided by San Jose Bike Valet. Parking will be located and First and San Carlos. Much easier than driving.